In Christianity, Judaism and Islam, Metatron is said to be one of the most powerful angels in Heaven. It is testimony to this power that Metatron was allowed to be seated in Heaven, a privelage that was reserved only for God.However, Metatron was seated because it was his role, as scribe, to record the history and deeds of humankind. Metatron's Cube can be formed from the Fruit of Life symbol, by using the points of intersection to make the shape geometrically correct. The power of this complex geometric symbol lies in the shapes of the five Platonic solids hidden within it. 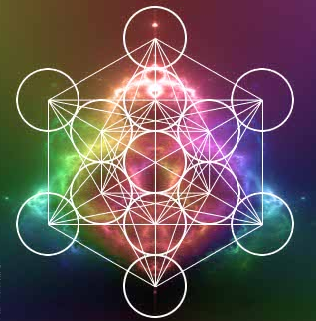 Early Kabbalistic documents say that Metatron formed his "cube" from his soul. Apart from its geometric significance, the cube is a powerful symbol of protection, able to keep away demons and other unwanted influences.